We expect a fabulist like Roald Dahl to exaggerate and push reality to extremes, and so it is in Matilda the Musical, Dennis Kelly’s adaptation of Dahl’s book for second-graders-and-up with music by Tim Minchin. Parents either adore their offspring to the point of absurdity, creating a universe where all children are exceptional, or they’re like Matilda’s Mom and Dad, Mr. and Mrs. Wormwood, disdainful toward all her prodigious gifts. Pity is, Dahl’s book was written in 1988, when middle-of-the-roaders ruled the political scene and moderation was a virtue. Dahl was outré back then. But now in a country besotted by the ideas that government can accomplish what is mathematically impossible and that government is an evil that should do nothing whatsoever, Dahl’s exaggerations nearly pale into realism. Adults really are that crazy. Children who are this bright, luminous, and innocent have walked through such harrowing worlds before. Oliver Twist and Little Orphan Annie may be considered as Matilda’s true ancestors in literature, pop culture, and hit Broadway musicals. Amid the Fagins, the Miss Hannigans, and the Bill Sikeses, there’s always a kindly Nancy or a Grace Farrell to shine rays of hope and sunshine into the gloom. Here it’s Matilda’s first-grade teacher, Miss Honey, who lives under the thumb of the school’s horrific headmistress, Miss Trunchbull. With the aid of outlandish costumes, the elder Wormwoods will still seem outré to the small fry in the audience, even in 2016. For the rest of us, their disdain for books and their faith in TV as an educational tool are sufficient markers. Dahl hasn’t pushed far enough, however, until he has Dad – a supreme creation of moronic conceit – insisting that Matilda is a boy from the moment she’s born, despite the evidence of her genitalia. Nor does Dahl mess with nuance when it comes to Trunchbull. The headmistress is a former Olympic medalist in the indelicate sport of the hammer throw, and she revels so much in cruelly punishing unruly students she has designed a torture chamber expressly for that demented purpose. The preternaturally sized harridan is portrayed by the fiercely outsized David Abeles, and even he is augmented by mammaries that runneth over any cups in the county. The frightfulness of Trunchbull and the blithe disregard of her used-car-salesman dad won’t faze any of the kids who have been baptized in Lemony Snicket, but that really isn’t the worst of this touring production’s baggage. Even on the second night of the run at Belk Theater, most of the kids were unintelligible. You’ll hear them, but what they’re saying is only fitfully comprehensible. The Observer’s review points out that printed copies of the lyrics are available in the street-level lobby, a less practical solution than supertitles when you’re sitting there in the dimly lit theater. I caught up with the lyrics in the booklet that accompanies the Broadway cast album, which helped me to further appreciate the clever recitation of the alphabet when we reached the “School Song,” circling back to Matilda’s first day at Crunchem Hall Primary School. Even the first part of this song worked for me on a visceral level when I saw the unintelligible elder students scaling the gate to the school like caged animals and snarling at the newcomers about to enter. Yeah, that first day can be scary. I’m assuming that the Broadway success of Matilda gives the lie to my contention that the show takes too much time to accomplish too little. Compared to the new School of Rock, which we’d seen nearly nine weeks earlier, my wife Sue and I found the kids onstage here less talented – and less molded into a genuine class by evening’s end. Three of Matilda’s classmates briefly pop into the spotlight at various moments, but there’s little rapport developing in the group, let alone camaraderie. Sitting in the cozier 1460-seat Shubert Theatre in New York, I’d imagine we would have heard the darling children more easily. The lighting is also presumably better up yonder. I could hardly make out a word on Miss Honey’s blackboard in Act 1, which ultimately diminishes the impact of the denouement after intermission. Three young actresses play the title role, compared with the four who share that responsibility on Broadway, but for some yet-to-be-explained reason Savannah Grace Elmer took over for Sarah McKinley Austin when the curtain rose Tuesday evening on Act 2. Both brought the requisite precocity to the table with a certain amount of British starchiness, just the thing for protagonists trapped in gray primary school uniforms. So the grownups outshine the kids, cartoonish as most of the important ones are. Looming like an epic soldier from the Trojan War, Abeles is discombobulated enough by little Matilda’s defiance to make “The Trunchbull” a tasty villain. Cassie Silva and Quinn Mattfield as the Wormwoods have even less rapport with each other than Matilda’s classmates, bickering at those rare moments when they even acknowledge one another. Both are loudly colorful in Rob Howell’s costume designs and compete spiritedly for the edge in comical cluelessness. It’s hard to say whether Stephen Diaz added more to Mom’s stupidity credentials or Dad’s as the mega-sleazy Rudolpho, Mrs. W’s competitive dance partner. Dad seems perfectly oblivious to their sensual tango rehearsals while Mom must miss a competition because a hospital physician informs her that she’s nine months pregnant. The consoling women in Matilda’s life don’t offer the poor waif much in the way of guidance and wisdom. 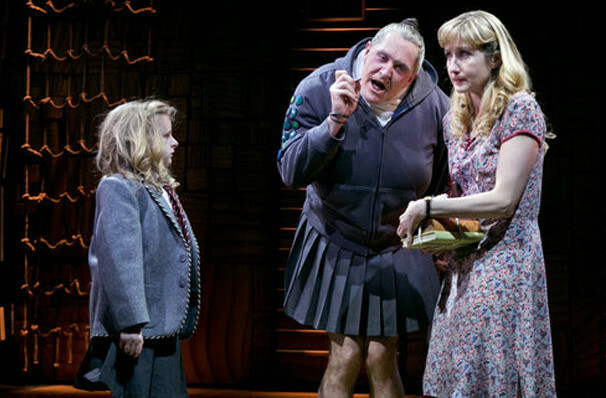 Obviously, the teacher is sweet: Miss Honey quietly defies The Trunchbull’s disciplinarian philosophy in her classroom, and Jennifer Blood strikes the right balance of timidity and righteousness when she meekly stands up to Trunchbull, advocating on behalf of her own humane pedagogy and Matilda’s special gifts. Ora Jones as Mrs. Phelps, the library lady, is a warm Gypsy-like sounding board for Matilda and a refuge from her absurdly broken home. Phelps encourages Matilda to spin the story that will ultimately be her salvation. That’s what I like most about Matilda, for Dahl’s story-within-the-story turns out to be a miracle of rare device.